The mental and physical pain that the Marine inflicted on those kids was similar to how inflammation works in our body when we experience pain. 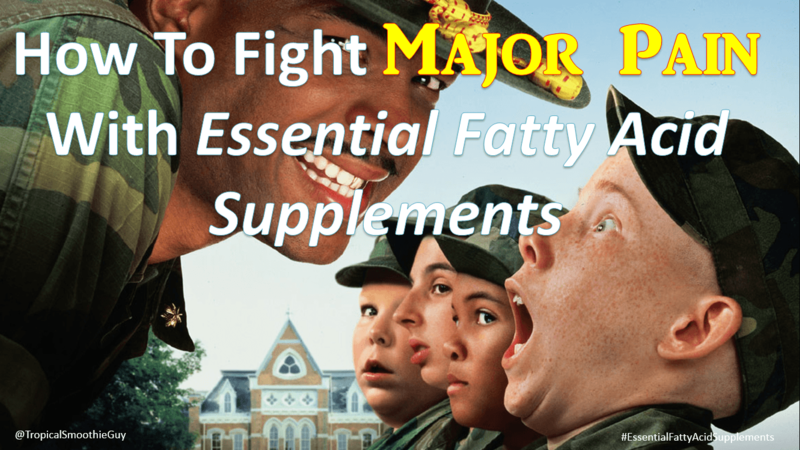 I’ll walk you through why essential fatty acid supplements are so important for your health and why this is a chronic issue for millions of people. Pain Sch-pain! What’s The Big Deal? Have you ever experienced any of the 5 situations below? I know I have experienced all but 2 (Arthritis and Fibromyalgia). They are NOT fun at all and make internal inflammation two words I don’t like even thinking about. I have broken more bones than you can count on your left hand and each time resulted in MASSIVE pain, swelling, and embarasement on my part. I will admit they were all due to my own clumsiness in sports or growing up as a kid and just “doing too much.” A couple examples include me jumping way too far out on the monkey bars in Columbus, Ohio (Goshen Lane Elementary) when I was a kid and breaking my left elbow. Talk about PAIN-FULL. Another example was me running track in my senior year of high school and tripping over a hurdle in the districts 300 meter race and breaking my left ankle. I later realized that I was blind as a bat and the doctor told me I shouldn’t have even been on the road as a driver. I was always told as a kid that I had “good” eyesight so I mistakenly went with that for so many years unnecessarily. Next we need to understand what inflammation is exactly. Inflammation is the body’s way of responding to injury and infection. It does this by giving you redness, swelling, warmth, and pain in the area of concern. Inflammation is an immune system reaction that allows the body to fight infections due to bad bacteria over population. The immune system also responds by repairing damaged tissue by dilating blood vessels and allowing for more vascular permeability. In other words, there is an increased blood supply to the injured or infected tissue to stimulate the internal repair process. The real problem occurs when there is too much inflammation or chronic inflammation that last for years. Over time, this can be debilitating and cause your quality of life to take a nose dive. Talk About A “Fishy” Situation…Boy You Is “Krillin” Me! Your body needs Essential Fatty Acids, especially in the form of Omega 3’s to function properly and to combat inflammation and pain. “Essential” fatty acids are “Essential” because our body can’t make them and we must get them from our food. A lot of people turn to fish oil or even krill oil but those are NOT the best options for your body. Fish oils are highly processed, deodorized (because they smell like…well rotten fish), and is often times sourced from fish raised in polluted waterways or fish farms (i.e. living and eating their own filth…that’s just straight up nasty). In addition to that, fish oil doesn’t contain fiber, vitamins, or minerals like organic whole foods. An easy plant based solution to address your body’s need for omega essential fatty acids is your weapon against inflammation (it’s like bringing a gun to a knife fight for once). People look to flax as the first choice for plant based omega 3 essential fatty acids and lignans, but there is just one wee-little problem. Flax seeds contain natural enzyme inhibitors to prevent digestion and absorption of nutrients. Why would mother nature do this to me? Doesn’t She know I need those seeds to digest and absorb fully in my body? As much as Mother Natural loves you, those lil seeds have a mission. Their lil mission is to pass all the way through your digestive system and still grow into a plant. Now it can’t do that if you break it down and take all it’s goodies (i.e. vitamins, nutrients, minerals, fiber, etc). Well then…How can I get the “key” to that guarded safe of amazingness? Sprouting eliminates these natural inhibitors and allows the nutrients to become available for absorption in your body. Another way to look at is that it takes the nutrients from the growing seed and gives them to you instead (U-Getz-2-Steal-Dem). What’s even more cool is that sprouting flax seeds biologically activates the seed and unlocks a an increasing amount (sometimes exponentially in %) of vitamins, minerals, proteins, fiber, and other nutrients transforming it into a live superfood! Half Flax…Half Amazing. Just sayin’. In 1997, A John Hopkins study concluded that one ounce of broccoli sprouts contained more anti-carcinogens than two pounds (32 ounces) of mature broccoli! That is over 32 times the nutritional power! The process involves seeds sitting in a damp environment for a long enough time so that the seed starts to sprout and grow. The seed is then gently dried so the spouted seed to retains its “raw” status. Anything dried or cooked above 116 degrees Fahrenheit kills and deactiviates the enymes that are needed for proper digestion. Another added benefit of going raw is that it stabilizes the essential fatty acids which helps to prevent rancidity and spoilage. Non-Sprouted ground flax seeds and flax oil have a shorter shelf life span. However, sprouted flax seed that has been cold milled and ground has at least a 2 year shelf life and requires no refrigeration, even after opening! The cold-mill grinding process of the sprouted seeds gets it to a texture that is very mix-ready for tropical smoothies, baked goods, salads, and sauces. Adding raw, organic, cold-milled, and sprouted flax seed to other foods will increase the fiber, nutritional value, and slow the release of sugar into your bloodstream for better energy stabilization. I have seen better digestion, more energy, and better weight management support with this supplement in addition to eating right on a daily basis. Unless you want to go to the store, buy some flax seeds, sprout them, dry them, grind them, and then put them in a bag, below is the benefits of the flax seed supplement that I’ve been using and thoroughly enjoy them. Sprouting increases the conversion efficiency of the essential fatty acids for better bioavailability (absorption). This is just an all around slam dunk for omega-3 nutrition and reducing inflammation in your body. Did you like today’s blog post? Feel free to check out my “FREE Holistic Nutrition Course” that will walk you through the Truth about what goes into health foods, supplements, and vitamins. This is a VERY SPECIAL Webinar that I’m offering to you for FREE because I love you so much (a $49 value)!